According to the Huffington Post, the 2013 hurricane season looks just as worrisome as the 2012 season: nine hurricanes predicted, four of which will be major, and 18 named storms. Meanwhile according to Bill McKibben, people’s refusal to accept to climate destabilization is finally taking on storm proportions in the form of a fossil fuel resistance. 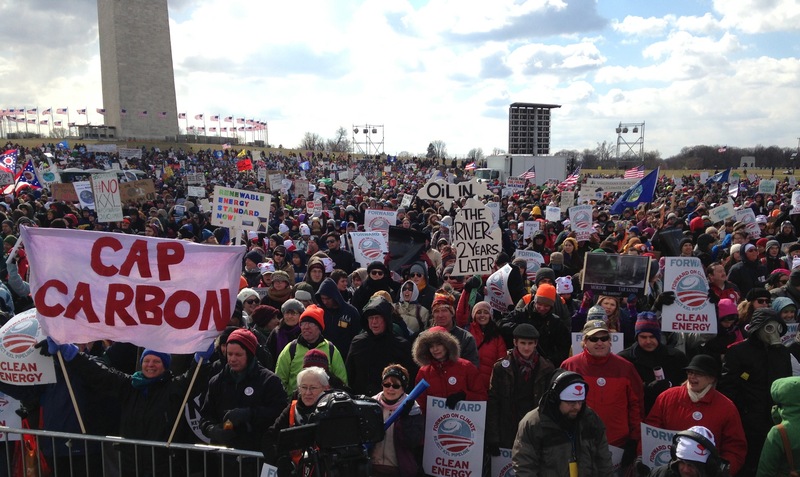 In February about 35,000 people rallied on the Mall in Washington D.C. to convince the Obama administration to deny permits for the construction of the Keystone XL pipeline, which would run from Canada to the Gulf Coast carrying sludgy and highly corrosive diluted bitumen oil (the same kind that recently seeped from Exxon Mobil pipes in Arkansas). Other rallies, like one I attended in San Francisco, drew several thousand people. There are other brewing national fights too, like the battle to stop coal exports from Washington and Oregon and stop fracking in upstate New York and other places, not to mention what’s going on internationally. In Ecuador, indigenous opposition is mounting against President Rafael Correa’s plans to open up virtually the entire Amazon to oil drilling. While there are many obstacles, I’m encouraged by these developments. We might finally be arriving at the moment when our most potent strategy is not in urging everyone to become eco-conscious consumers, but in urging people to take up the mantle as citizens and demand policy change. Changing consumer habits is enormously important and has been successful: the rise of organic agriculture and innovations in urban farming, the prevalence of recycling, and even the efforts of many corporations to cut waste and use more sustainable materials. While some of that is green-washing, of course, the consumer pressure is real. But it has its limits. In international development, people have endless arguments about “taking it to scale,” in other words how to make a solution that works for 1,000 people work for 10 million. As much progress as we’ve made changing our consumer habits, as individuals, even millions of individuals, we will never be able to take these improvements to scale. Climate destabilization is largely the result of an economy that externalizes the true cost of energy for production and creates enormous waste. While consumers certainly play a role, they simply don’t have the power to rein in the producers at a global level. The longer that we delude ourselves that they (we) do, the more precious time we lose. From the most cynical point of view, it’s in the interests of most producers–and their government allies–to heap all the responsibility on consumers. Producers can make modest changes based on consumer preferences and still reap the benefits of a system that profits them in the short-term and requires the public to pick up the tab for the damage they do. Making people feel powerless as citizens, and spuriously powerful as consumers, is in producers’ interest. In the U.S., we have conflated our role as consumers with that as citizens. We have bought into the myth that our purchasing power is equivalent to our political power. For a problem of this magnitude facing an industry as wealthy and entrenched as the fossil fuel industry, it isn’t. For a problem that requires we change our laws now, it isn’t. No number of Priuses on the road will make TransCanada decide to cancel the Keystone XL project and invest in wind turbines. Consumers acting as individuals can’t reform the system, because government policies and laws are not created by consumers. In a democracy, they are created by citizens. And citizens, as Bill McKibben observes, are forming a Resistance, an increasingly organized and tenacious movement that counts the NAACP, Idle No More, college students, former hedge fund managers, and religious leaders, to name a few, among its ranks. The challenge is to keep widening the circle so more people, even those who think they don’t have time or erroneously conclude that climate destabilization is a far off problem that won’t impact them, find a role as citizens, not consumers. It’s no longer enough to eat a vegetarian diet, take the bus to work, or use cloth grocery bags. It’s no longer enough to think global and act local. We’ve got to think global and act political. Otherwise, all of that conscious consumerism becomes little more than a way to assuage our guilt over what we are allowing to happen to the planet. So what does conscious citizenship look like? Calls to Congress or President Obama, rallies, online petitions (like the one to the State Department during its official comment period on KXL), tweets and Facebook posts, house parties, even letters to the editor, many things that don’t take much time but have real collective effect. Many advocacy groups, from League of Conservation Voters to the Energy Action Coalition, organize these campaigns so that it’s easy for people to get involved. If you think these actions don’t make a difference, remember Keystone XL was a “done deal” in August of 2011. Except citizens organized to stop it through texts and tweets and petitions and rallies and civil disobedience. Almost two years later, Keystone is still an iffy proposition, the Resistance is gaining steam, and democracy looks like it might have some fight in it yet. I LOVE this post. Really, Mary, you’ve hit your stride. “Think global, act political”–the new slogan or meme for the 21st century! And such great links. Thank you for weaving together the many strands of the issue together into a powerful whole. Thank you, Wendy! I’m so glad you put Idle No More on my radar a few months ago.